So one last daily draw to type up before I switch off decks again. This one is really from yesterday, but it's been bouncing around in my head since I saw the cards so figured it was the one worth writing about. We have here a rather interesting juxtaposition of the Page of Wands and the Three of Swords. We have in the first a youth, putting himself out there, innocent, inexperienced but confident in his abilities - at least enough so to want to prove himself, to gain external validation; and indeed, a rather impressive young lad he is. 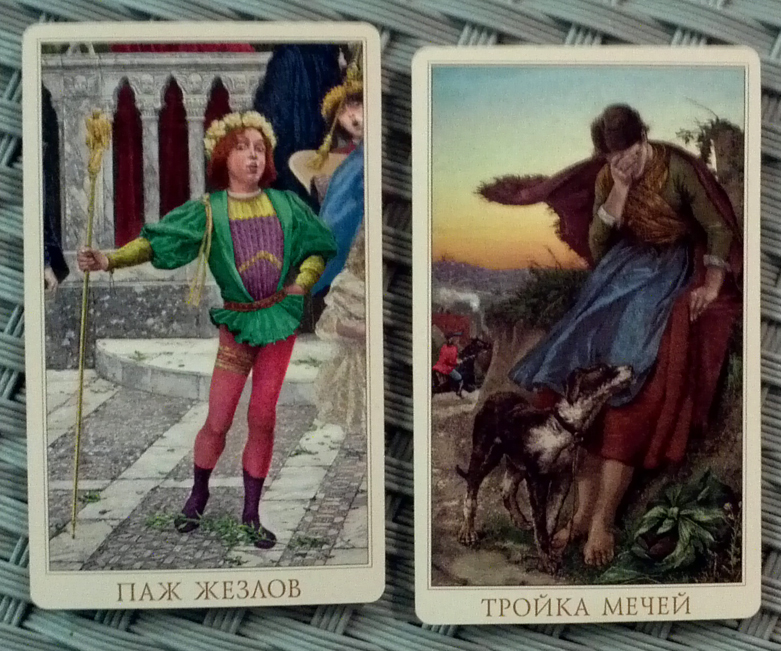 In the other card we have a woman, older, worn down by life, suffering. Crying with grief or frustration or just plain for-no-particular-reason sadness. What strikes me here is both the isolation - the way she seems to be hiding deliberately behind a cliff so that no one will witness her pain - and the dog, a loyal companion, a constant source of comfort even in the most difficult times. Put together, these two cards paint a picture I find especially familiar. Thinking about the draw, it also helps me realize better the real source of some of my current frustrations, not-too-serious though they may be. In particular, I find myself recently getting inordinately annoyed hearing a few particular people make excuses, again and again, for their own poor behavior or failure to fulfill certain responsibilities. To me, there are explanations, which may or may not be relevant and even worth getting into, but very rarely do those truly amount to being excuses. This is a pretty well understood idea, but it doesn't in and of itself explain why I get so EMOTIONALLY frustrated in such situations, especially when the excuses weren't even directed (or directly effecting) ME. Looking at these cards though, I see a lot of myself and how I tend (and try) to operate in them. To me, the things you must do are a long list, and whether you consciously realize it or not, you do prioritize them. Although I definitely do have an ongoing issue (that I AM trying to work on, if to very varying degrees of success) with not getting many of them done... the ones I have the most trouble with are the ones that, for whatever reason, de-facto aren't the highest priority. The things I really prioritize - doing all my schoolwork, getting reading and assignments done, showing up and performing adequately at any job I may have, paying my bills on time, etc - those DO get done, regardless of difficulties I may be having. And even though I don't like to get into too much detail here...sometimes difficulties can feel...very intense and difficult indeed. But of course, judging other people is a pointless exercise that can only contribute to your own inner negativity. Enough things in my own life and actions to get upset about, no need to add others to that if I don't need to. So going to work on letting go of those unnecessary feelings, and focusing instead on being more responsible in my own life with getting things done. These weeks with the Victorian Romantic have been GREAT, I must say. The deck has lovely cardstock that's a true pleasure to shuffle, and the readings I've been getting have been quite awesomely deep. There's so much to plumb in the rich imagery of this deck. Looking forward to working with it again in the future! I'm getting this deck in the mail soon and I can't wait. That three of swords makes my heart clutch a little bit, which is exactly the kind of response you want to have to one of those. Valuable insights as always, Bonkers! The Victorian Romantic in Russian? I love it!